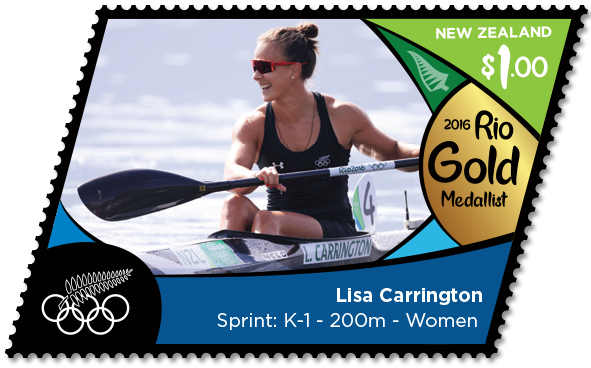 Virtual New Zealand Stamps: Olympic & Commonwealth Games. 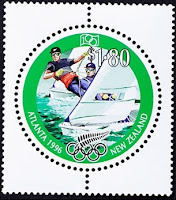 This post is a collection of stamps, issued by New Zealand, to celebrate Olympic and Commonwealth Games in which men and women from New Zealand have competed in. 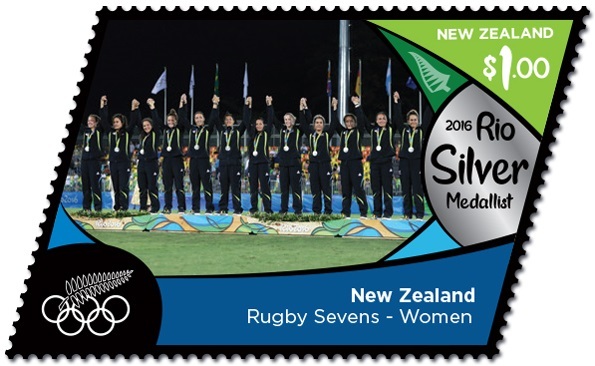 The stamps don't just celebrate the games, but also tell of many of the success stories New Zealand has had. 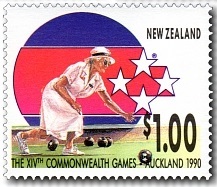 Note that not every games that New Zealand competed in are represented here because New Zealand Post didn't always issue stamps. 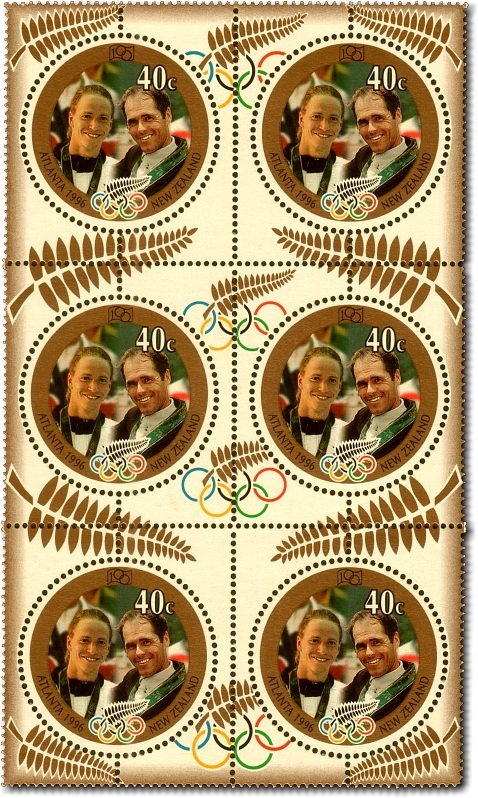 I enjoyed this post because I came across many stamps I had never seen before and it also opened my eyes to just how successful New Zealand has been at these games. Amazing for such a small country. I've heard New Zealand-born friends proudly boast what a great little country this is. Now I've discovered another way in which this is true. 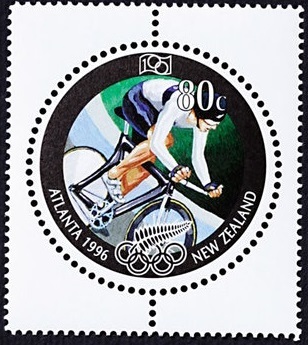 New Zealanders competed in the Olympic Games for the first time in London in 1908 as part of the Australasian team, and New Zealand participated for the first time as a separate nation at the Antwerp Games in 1920. It was there that rower Darcy Hadfield won this country's first medal - a bronze in the single sculls. New Zealand's first gold was for boxing at the 1928 Amsterdam Olympics. Total Olympic medals:- Gold - 46; Silver - 28; Bronze - 44; Total - 118. Total Commonwealth Medals:- Gold - 144; Silver - 203; Bronze - 262; Total - 609. 1968 Health - Olympic Games, Mexico. 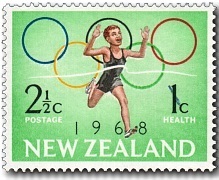 Following the then current theme of sports, the annual Health stamp issue in 1968, featured two Olympic sports, since it was an Olympic Games year. 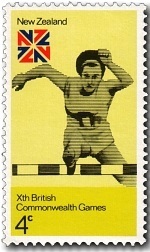 The goal of Health Stamps is to help children, See our Health Stamp pages above), so one stamp depicted a boy in an athletics event and the other a girl in a swimming event. Each design included the Olympic emblem of five rings. The proceeds of the 'Health' value of health stamps were donated to the Children's Health Camps movement. 2½c + 1c - Boy Running - Olympic Logo. 3c + 1c - Girl Swimming - Olympic Logo. New Zealand was placed 27th at these Games with 1 gold, 0 silver and 2 bronze, a total of 3 medals. 1972 Olympic Games - Munich. 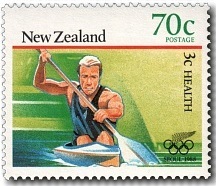 The success of New Zealand rowers at the 1972 Olympics was the highlight of years of dedicated training and devotion to the sport. 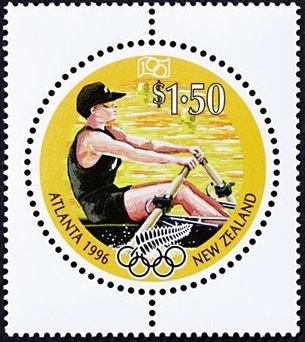 Rowing, as a competitive sport, is believed to have begun in NZ on Lyttelton Harbour on New Year's Day in 1862. A number of clubs had formed throughout the country by the time the New Zealand Amateur Rowing Association was formed at a meeting of the representatives of nine clubs in 1887. 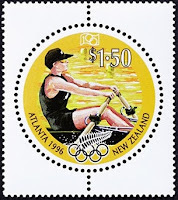 New Zealand's greatest rowing triumph came at the Olympic Games at Munich in 1972, when the eight won the gold medal (Hurt, Veldman, Joyce, Hunter, Wilson, Earle, Coker, Robertson, and Dickie, the cox), and the four (Tonks, Storey, Collinge and Mills) won the silver in their event. 1974 Commonwealth Games - Christchurch. 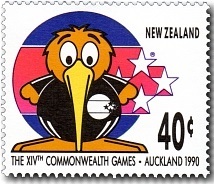 In 1974, forty-four years after the first Empire Games in 1930 at Hamilton, Ontario, Canada, over thirty countries and approximately 2000 athletes took part in the 10th British Commonwealth Games at Christchurch, New Zealand. 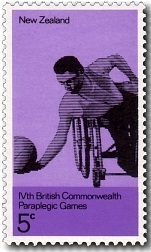 The first Paraplegic Commonwealth Games were held in Perth, Western Australia, in 1962. 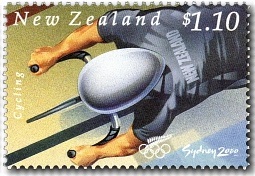 In 1974 the 4th Paraplegic Games were held in Dunedin, New Zealand. 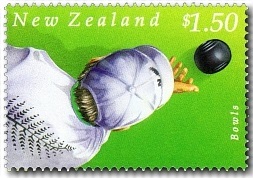 To commemorate these two sporting events in New Zealand in 1974 five stamps were issued. The stadium and swimming pool built for these games were both destroyed in the recent Christchurch Earthquakes. 4c - Women's Hurdles. 5c - Men's Paraplegic Basketball. 10c - Cycling. 18c - Rifle Shooting. 23c - Men's Lawn Bowls. New Zealand won 35 medals at these games taking 4th place behind Australia, England and Canada. Our medal count was 9 gold, 8 silver and 18 bronze. 1988 Health / Seoul Olympic Games. 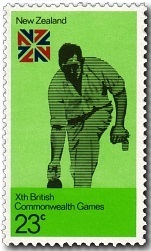 There would be a gap of 14 years before any more stamps were issued for either the Commonwealth or Olympic Games. 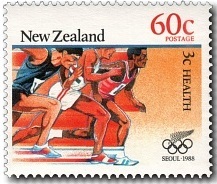 In 1988 four stamps were issued, as part of the Health Stamp series, celebrating the Seoul Olympic Games. The 1988 Summer Olympic Games was held in Seoul, South Korea. 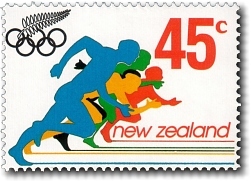 New Zealand competed at the Games, sending 83 competitors, 67 men and 16 women, took part in 58 events in 16 sports. Our result was we were placed 18th at the Games, taking 3 gold, 2 silver and 8 bronze, a total of 13 medals. 40c - Swimming. 60c - Track and Field. 70c - Canoeing. 80c - Equestrian. 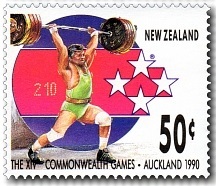 1989 XIV Commonwealth Games in Auckland. 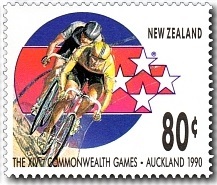 The 1990 Commonwealth Games were held in Auckland and NZ Post issued an 8 stamp issue to celebrate these games. 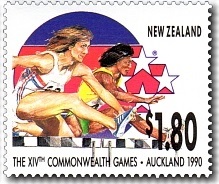 The stamps were issued early, during the 1989 calendar year, to help promote the games both in New Zealand and Overseas. 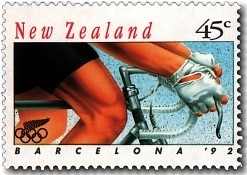 Two further Souvenir Sheet sheets were issued in January 1990. 40c - Official Games Logo. 40c - 'Goldie' Official Event Mascot. 40c - Men's Gymnastics. 50c - Men's Weightlifting. 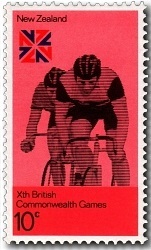 80c - Men's Cycling. 65c - Women's Swimming. $1.00 - Women's Lawn Bowls. $1.80 - Women's Athletics. 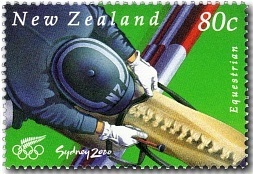 1992 Olympic Design A Stamp Competition Winner. 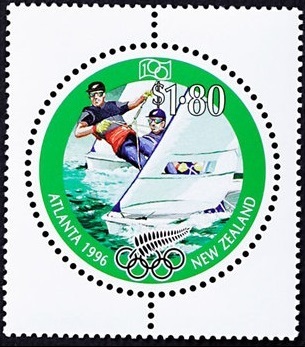 In May 1992 a four-stamp Olympic issue, designed by Martin Bailey, was issued featuring two events New Zealand had previously won gold medals in - sailboarding and equestrian three-day eventing - together with and cycling and archery. 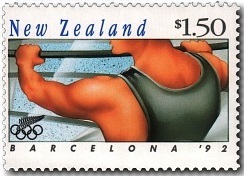 This stamp issue was voted the world's best Olympic stamps in 1992. 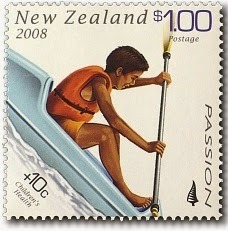 The New Zealand Olympic Committee was represented by 134 athletes and 70 officials. 134 competitors, 92 men and 42 women, took part in 87 events in 17 sports. New Zealand was ranked 28th in these Games with 1 gold, 4 silver and 5 bronze, a total of 10 medals. 45c - Cycling. 80c - Archery. $1.00 - Equestrian. $1.50 - Sailboarding. 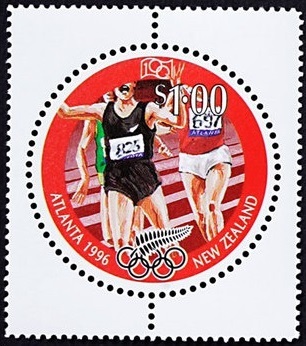 In July 1996, the Centennial Olympic games were held in Atlanta, Georgia in the United States. 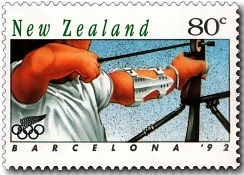 Five sports in which New Zealand was represented were featured on the stamp issue. 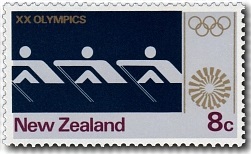 Each of the five stamps, designed by Stephen Fuller, has a border in the colour of one of the five rings which make up the universally known Olympic logo. Blue, black and red in the top row with yellow and green on the row below. 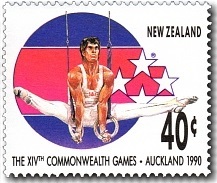 New Zealand was ranked 26th at these Games with 3 gold, 2 silver and 1 bronze, making a total of 6 medals. 40c - Swimming. 80c - Cycling. $1.00 - Athletics. $1.50 - Rowing. $1.80 - Yachting. 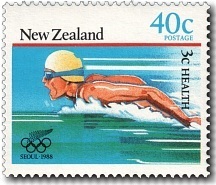 In the first day of competition, New Zealand halted to watch Danyon Loader power home in the 200 metres freestyle. Several days later he won a second individual gold, this time in the 400-metre freestyle. God Defend New Zealand was heard a third time at Atlanta. Blyth Tait, riding Ready Teddy, secured Olympic glory in the Individual Three Day Event after an outstanding display of show jumping. 2000 Sydney Olympic Games and Sporting Pursuits. Athletes from over 200 nations competed for their countries at the 27th Olympiad in Sydney, Australia. 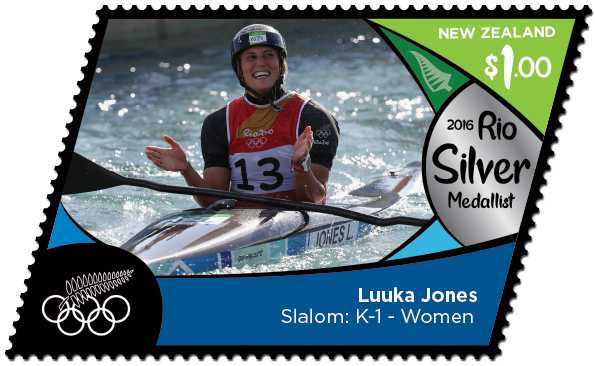 To mark this significant sporting event an Olympic & Sporting Pursuits stamp issue, incorporating four Olympic and two non-Olympic sports, was released. 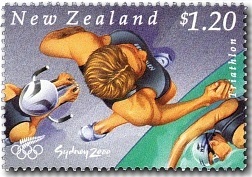 New Zealand competed at the 2000 Summer Olympics in Sydney, Australia. 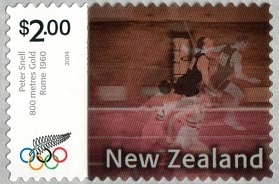 The New Zealand Olympic Committee was represented by 151 athletes and 100 officials. 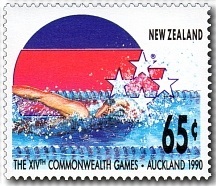 In these games, New Zealand took 1 gold and 3 bronze medals. Gold - Rob Waddell - Rowing. 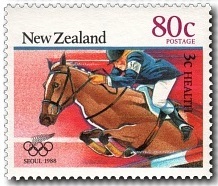 Bronze - Mark Todd - Equestrian. Bronze - Aaron McIntosh - Sailing. Bronze - Barbara Kendal - Sailing. 40c - Rowing. 80c - Equestrian. $1.10 - Cycling. $1.20 - Triathlon. $1.50 - Bowls. $1.80 - Netball. 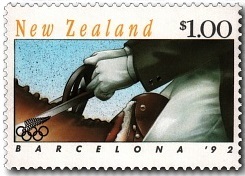 New Zealand competed at the 2004 Summer Olympics in Athens, Greece, from 13 to 29 August 2004. 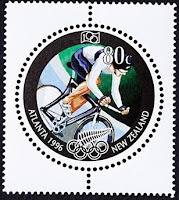 This was the nation's twenty-second appearance at the Olympics since its debut in 1908 as part of Australasia. 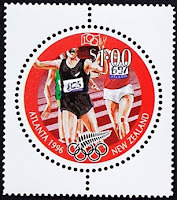 The New Zealand Olympic Committee sent a total of 148 athletes, 81 men, and 67 women to the Games to compete in 18 sports, surpassing a single athlete short of the record from Sydney four years earlier. 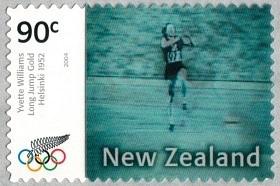 Basketball and field hockey were the only team-based sports in which New Zealand had its representation at these Olympic Games. There was only a single competitor in archery, boxing, and fencing. 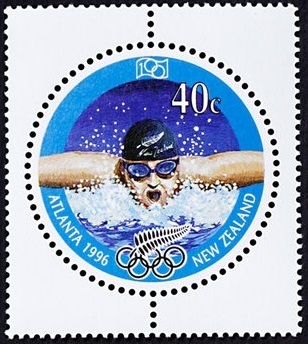 New Zealand left Athens with a total of five Olympic medals, three golds and two silver, finishing twenty-fourth in the overall medal count. 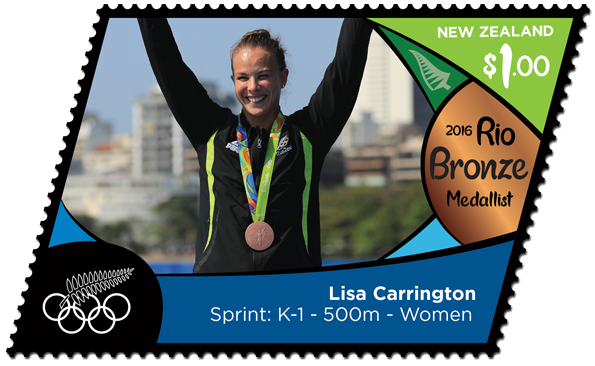 Four New Zealand athletes won Olympic gold medals for the first time in history: Hamish Carter in men's triathlon, track cyclist Sarah Ulmer in women's individual pursuit, and twin sisters and rowers Caroline and Georgina Evers-Swindell in women's double sculls. 45c - John Walker / Montreal - 31 July 1976 (Self-Adhesive). 90c - Yvette Williams / Helsinki - 23 July 1952 (Self-Adhesive). $1.50 - Ian Ferguson and Paul MacDonald / Seoul - 30 September 1988 (Self-Adhesive). $2.00 - Peter Snell / Rome - 2 September 1960 (Self-Adhesive). 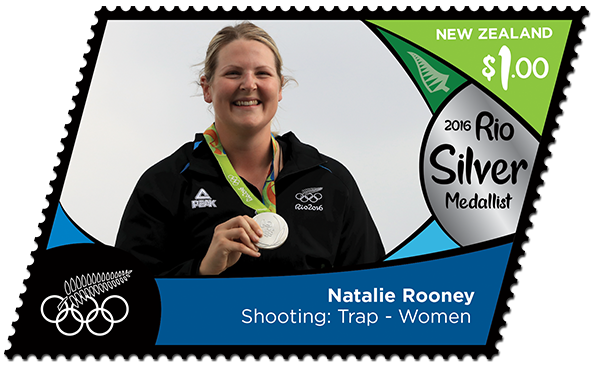 The technology behind these stamps. The effect of movement is created through a special printing process called Lenticular. This effect is achieved by two or more images being printed together, or 'inter-laced', into each other. These are printed around the wrong way on the back of a special lens material. Due to the optics of the lens, your eye is forced to see only a very small area of the lens at a certain angle. So, when you tilt the stamp, the images in the stamp appear to move. 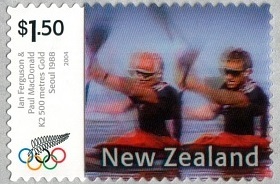 New Zealand took part in the 2008 Summer Olympics in Beijing, China. The country sent 182 competitors, making this its largest ever delegation to the Olympic Games. 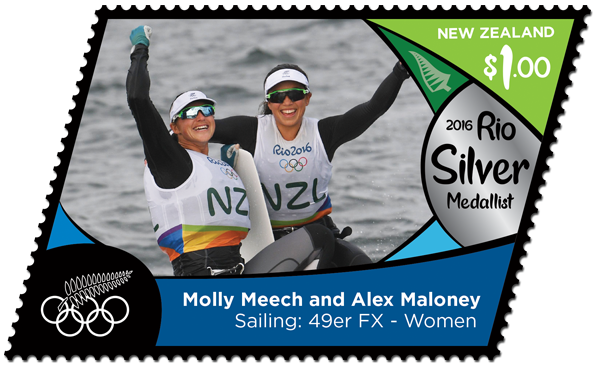 It was also one of the most successful, equalling New Zealand's combined medal tallies from the previous two Summer Games. 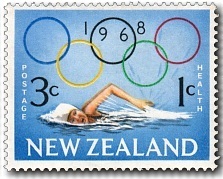 On 16 August – dubbed "Super Saturday" by journalists – New Zealand had its greatest single day at any Olympics, winning 5 medals: two gold, one silver and two bronze. 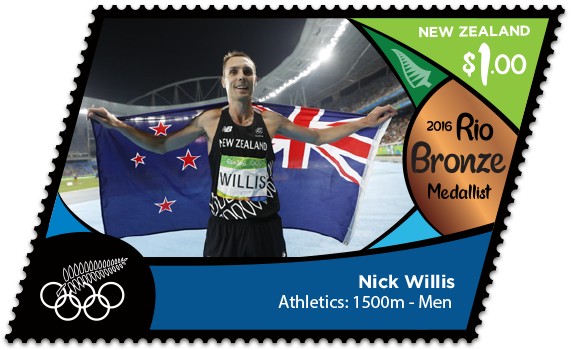 New Zealand also gained its first Olympic track medal since 1976 when Nick Willis won the silver medal in the men's 1500 metres, becoming the sixth New Zealander to win an Olympic medal in that event. The success at the Olympics has boosted Athletics participation since then. 50c - Cycling / Passion. 50c - Rowing / Celebrate. $1.00 - Kayaking / Succeed. $1.00 - Athletics / Motivate. 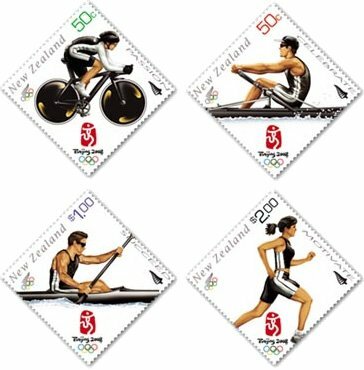 In 2008 NZ Post issued a set of four stamps to mark the Beijing 2008 Olympic Games. Three of these designs were used for the 2008 Health Issue as well. 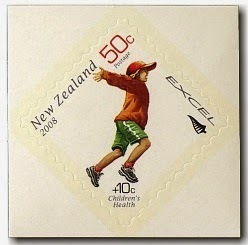 Where the Olympic Issue used adult athletes on the stamps, the 2008 Health Issue featured children. 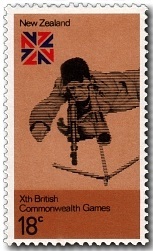 What is unusual about these stamps is that they set on their lower corner rather than their lower side as can be seen in the illustration above. 50c+10c – Inspire. $1.00+10c – Passion. 2012 Olympic Games - London. 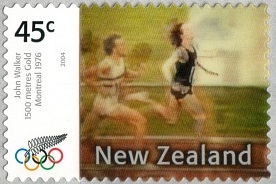 New Zealand competed at the 2012 Summer Olympics in London, from 27 July to 12 August 2012. This was the nation's twenty-fourth appearance at the Olympics. The New Zealand Olympic Committee sent 184 athletes, 97 men, and 87 women to the Games to compete in 16 sports, the nation's largest ever delegation. No stamps were issued for these games in 2012. 2016 Olympic Games - Rio de Janeiro. 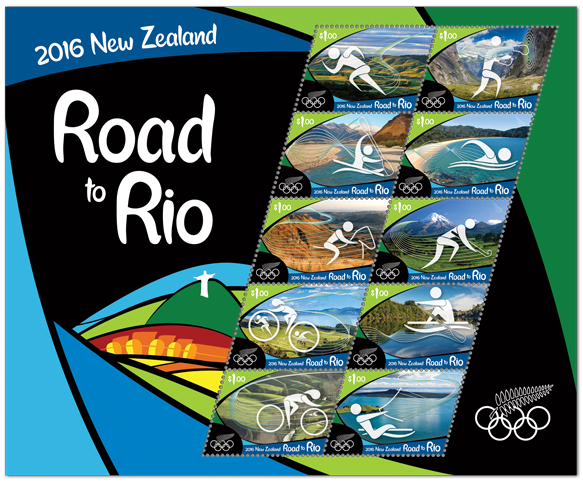 New Zealand competed at the 2016 Summer Olympics in Rio de Janeiro, Brazil, from 5 to 21 August 2016. 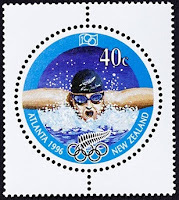 The New Zealand team consisted of 199 athletes, 100 women and 99 men, across twenty sports, the first time New Zealand was represented by more women than men at the Summer Olympics. The New Zealand team collected a total of 18 medals, four gold, nine silver and five bronze, at these Games, surpassing a record of 13 gained at both the 1988 and 2012 Summer Olympics; it also exceeded High-Performance Sport New Zealand's (HPSNZ) target of 14 medals for the Games. The ten $1.00 stamps of the original issue in a miniature sheet above. The eighteen $1.00 issued to celebrate each medal won at the games. $1.00 - Jo Aleh and Polly Powrie. 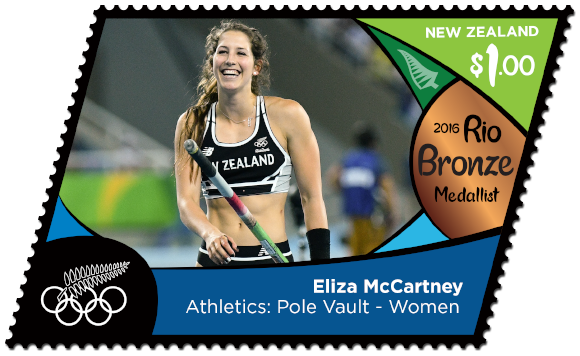 $1.00 - Eliza McCartney. 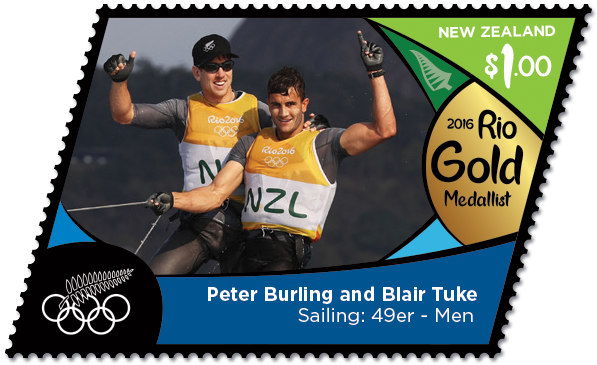 $1.00 - Peter Burling and Blair Tuke. $1.00 - Lisa Carrington. $1.00 - Lisa Carrington. $1.00 - Luuka Jones. 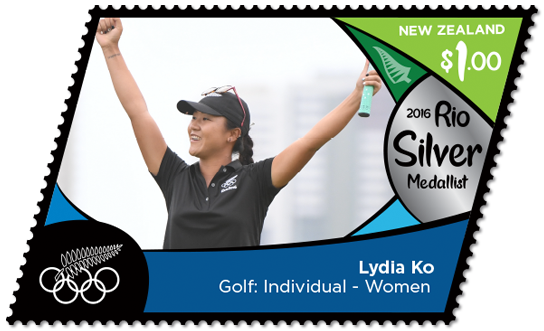 $1.00 - Lydia Ko. $1.00 - Mahe Drysdale. 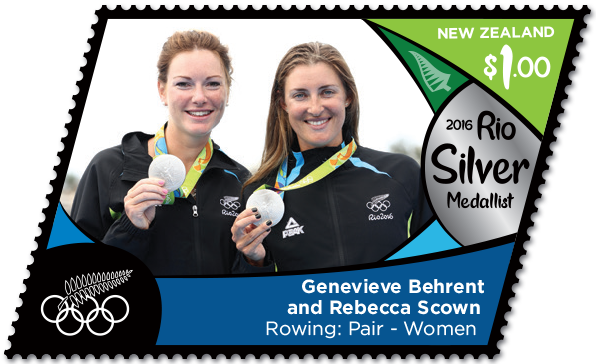 $1.00 - Genevieve Behrent and Rebecca Scown. $1.00 - Molly Meech and Alex Maloney. 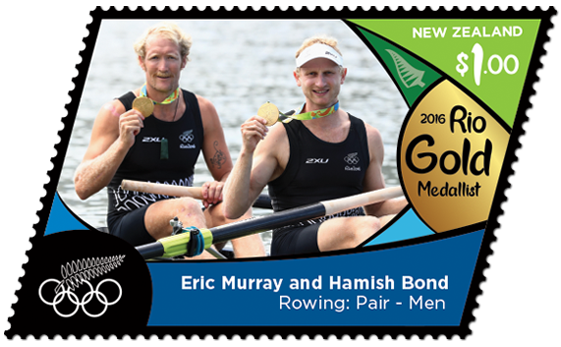 $1.00 - Eric Murray & Hamish Bond. $1.00 - Natalie Rooney. $1.00 - Nick Willis. $1.00 - Sam Meech. 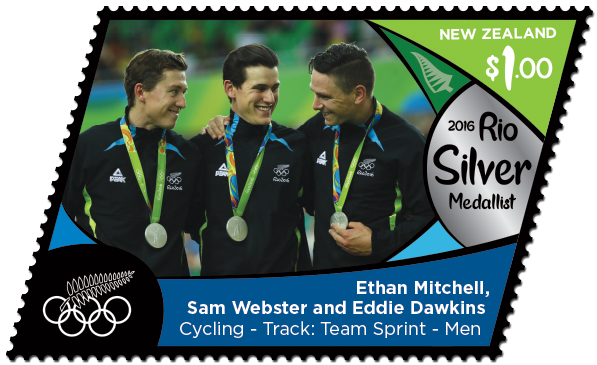 $1.00 - Ethan Mitchell; Sam Webster; Eddie Dawkins. $1.00 - Tom Walsh. 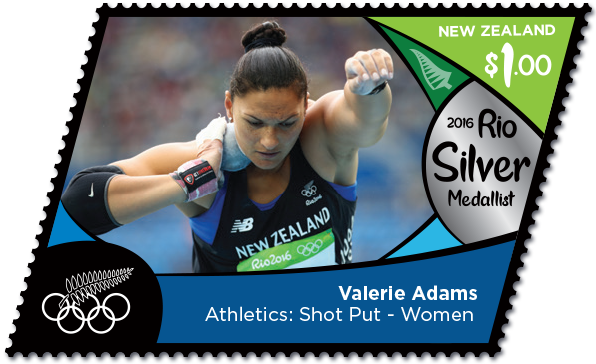 $1.00 Valerie Adams. 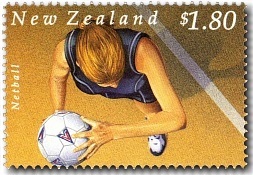 $1.00 - Rugby Sevens - Women. 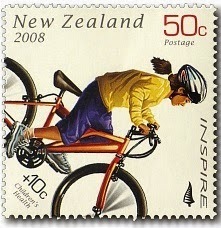 A great write up on the issues by NZ Post and the Post Office. 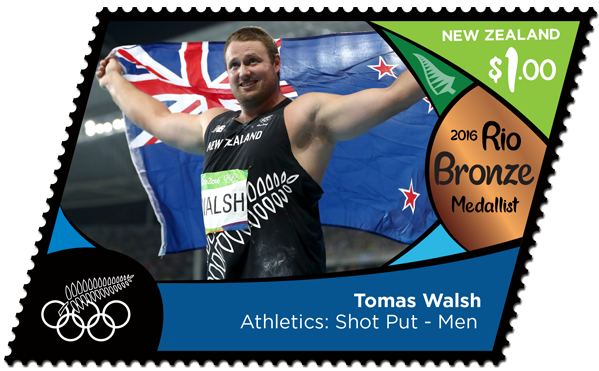 I have been researching NZ sports people featuring on overseas stamps. It is a work in progress and they crop up from the most unlikely postal administrations. 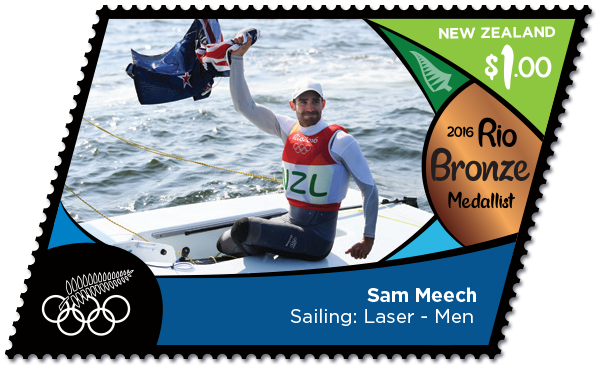 For example Nathan Cohen & Joseph Sullivan London 2012 Olympic Games Men’s Double Scull from New Zealand featuring on a single stamp sheetlet from Sierra Leone issued 21.12.15. 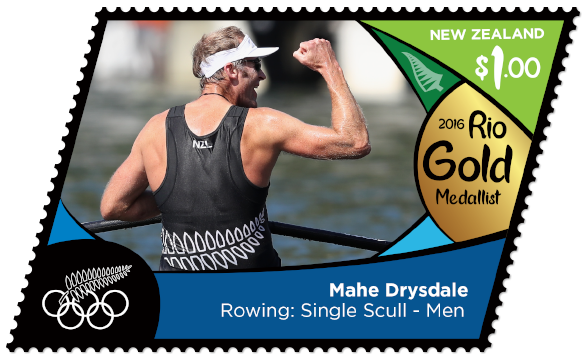 The same issue also features Mahe Drysdale Men’s Single Scull New Zealand. I've just published your comment here and sent texts to Kim and Allan. One of them should reply in the next couple of days. If you wish to contact us you can give us your contact details in another comment. Just mark it as "Do Not Publish"